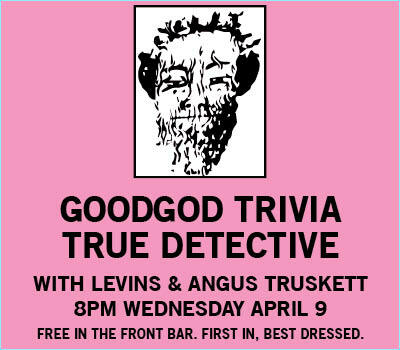 Hot on the heels of the first season finale, Goodgod is proud to announce True Detective Trivia! Who knows the most about the most talked show of the year? Levins and Angus Truskett will be your hosts for the evening, seeing just how closely you watched Woody & Matthew’s dark, brooding bro-down mystery. Time may be a flat circle, but this is the first time we’ve ever done this… so get in early with your crew and stake out a primo table! First questions from 8pm.